On Tuesday morning, almost 10 years after the U.S. government began using drones to target suspected militants in Pakistan—one of the tools of the War on Terror that the Obama administration has embraced and expanded since taking office in 2009—Congress heard from some of the policy’s innocent victims for the first time. 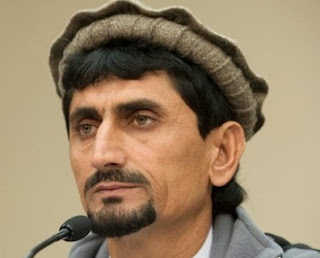 In the Rayburn House Office Building, Pakistani school teacher Rafiq ur Rehman and his two children, 13-year-old Zubair and 9-year-old Nabila, recounted before five members of Congress how an October 2012 drone strike in their native tribal region of North Waziristan killed Rehman’s 67-year-old mother and left the family physically and mentally scarred. Momina Bibi was gardening on the eve of the Muslim holy day of Eid al-Adha, Rehman said, when she was hit and immediately killed by the strike. Nabila and Zubair were also both injured. Neither the CIA nor the White House has commented on the specific attack. Organized by Rep. Alan Grayson (D-Fla.) in conjunction with the progressive media non-profit Brave New Foundation, the briefing was not a formal hearing. In fact, there were some concerns that it would not take place at all, given that the family’s lawyer, Shahzad Akbar, who has investigated drone strikes in Pakistan for the last three years and directs the Foundation for Fundamental Rights, was denied a visa by the U.S. government. Linsey Pecikonis, a spokesperson for Brave New Foundation, says she wasn’t sure the meeting was actually going to happen until the Rehman family physically made it out of the airport in Washington last week. Nonetheless, five members of the House were in attendance, including Grayson, Reps. Jan Schakowsky (D-Ill.), who’s a member of the Intelligence Committee, Rush Holt (D-N.J.), John Conyers (D-Mich.) and Rick Nolan (D-Minn.). In addition to comments from the Rehman family and members of Congress, the briefing featured remarks from Brave New Foundation President Robert Greenwald and Jennifer Gibson, a lawyer with the United Kingdom-based non-profit Reprieve. Though Tuesday’s briefing was a milestone because it was the first face-to-face contact members of Congress have had with victims of the drone wars, it was ultimately short on specific demands or requests. All of the representatives on hand expressed general concerns about the lack of transparency, and the civilian costs. Conyers and Holt did call for a congressional investigation into the targeted killing policy, but considering their generally little influence over the Armed Service and Intelligence Committees, a formal inquiry is highly unlikely in the near term. “The appropriate committees generally are staffed by people, if I may say this, who are friends of the military-industrial complex,” Grayson said. Instead, the briefing’s objective seemed to be about putting generalized pressure on the White House to open up more about the legal justification and oversight mechanisms associated with its targeted killing program. To date, the administration has not released any legal memos justifying the policy. Meanwhile, during the last ten years, the CIA and Defense Department’s drone strikes have killed almost 3,000 people in Pakistan, Yemen and Somalia, according to the London-based Bureau of Investigative Journalism. In Pakistan specifically, the Obama administration has overseen 325 of the 376 total strikes. The briefing also came amid increased recent scrutiny of the United States’ targeted killing program—both domestically and internationally. Last week, Amnesty International published a report concluding that CIA officials in charge of the policy in Pakistan may have committed war crimes, given that the group estimates drone strikes have killed up to 900 civilians in the country. Pakistan’s Prime Minister Nawaz Sharif asked President Obama to end strikes in his country during a meeting at the White House last week, and recent UN reports have also called on the United States to launch a public investigation of its program in general. The U.S. has since defended the program’s oversight and legality to the UN. And on Thursday, Rep. Adam Smith (D-Wash.), a supporter of the Obama administration’s use of drones and the ranking member on the Armed Services Committee, criticized the program’s lack of transparency—no small gesture given his position and party affiliation. CODEPINK’s Medea Benjamin, a longtime peace activist and perhaps the most well-known critic of drone usage as a result of her exchange with the President during a speech in May, says she was pleased with the briefing. The representatives on hand also stopped short of endorsing Amnesty’s suggestion that strikes like the one that killed Mamana Bibi amount to war crimes. When In These Times asked the three members of Congress who were in the room about it in the briefing's open-ended question-and-answer session, Holt did not answer and Nolan deflected the query. Grayson later said during the briefing that he didn’t think drone strikes amounted to war crimes, because they aren’t deliberately designed to kill civilians. Benjamin isn’t convinced. “I think I would be a little stronger in the condemnation, of course, but I’m not a Congressman. So I can call a war crime a war crime,” she says. But for the Rehman family, it doesn’t matter that the strikes’ civilian casualties are unintentional. They, like many others in Pakistan and elsewhere, are still suffering from them. At one point during the briefing, a reporter asked Rafiq ur Rehman what he himself would tell President Obama if given the chance. > The article above was written by Cole Stangler and is reprinted from In These Times.